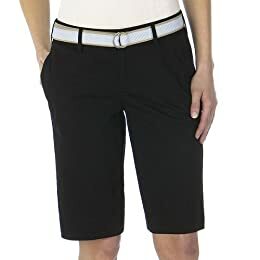 I confess, I have three pairs of black Bermuda shorts. I’ve bought all of them since May and I’m loath to give them up in September when the chilly weather is bound to arrive. It’s turned into a habit similar to searching for the next pair of perfect jeans or unsticky lip gloss. I see a pair, I try them on, and I justify buying them because they’re just a little different from the other two pairs I already own. It all began with Target’s Merona Bermudas. I paid $18, but they’re a steal now at $12.59. They are the perfect Sunday brunch shorts that put a little class into my roll-out-of-bed weekends. My next acquisition was Banana’s cropped black cotton pants. Just a little longer and a little dressier than the first, but oh-so-wonderful at $49. These flow from the office to happy hour and back with a cute cardi and long beads. And the third… J.Crew’s solid 9” chino (no longer available in black, but still in plenty of other necessary colors! ), which was the casual cousin of the first two pairs and ideal for kicking around home. What are you going to have trouble not wearing this fall? Tell us in the comment section below!